Physics-based fluidic action flows onto Wii U in Neko Entertainment’s Puddle. This Nintendo eShop release sees you employ the use of the Wii U GamePad’s gyro sensor, tilting the controller to the left or right as you carefully steer a puddle of fluid toward a target goal. Momentum is your tool for survival, trial and error necessary as you become increasingly aware of hazards placed in your way. Those with an aversion for motion controls needn’t worry, with Neko Entertainment has seen fit to incorporate additional control schemes – instead using either the ZL/ZR Button(s) or Left Stick to tilt the screen in either direction. Environments that you’ll find yourself flowing through are particularly well varied, the player finding themselves navigating through a clutter of pipes, plants, a laboratory and even a rather surreal traversal through the human body. These are just a few examples, but the alteration in locale coupled with the differentiation in liquids amounts to a gaming experience that will often keep you on your toes. Each liquid is granted its own properties; fertiliser, for instance, making certain plants grow, whilst weed killer allows you to break certain branches along your journey. Yet such benefits don’t come without their weaknesses. Contextual hazards soon threaten to devour the liquid that you control, players needing to respond in time before they see it drift toward them and helplessly evaporate away. These dangers can be from such elements as water-absorbing plants, spinning test tubes, hot surfaces, or electrical sparks. Whilst geared toward getting in your way, these soon prove an incomprehensible nuisance. With players only able to tilt in two directions, you’re often brutally caught out with little opportunity to prevent your fluid’s fate. It’s a regrettably cheap way of endorsing multiple attempts and will prove of immense frustration after the same tricks are played on you over and over again. If you do find yourself stuck on a particular level, all is not lost. You’re given a set number of ‘Whines’ to use that grant you free passage to the next, returning at any point to tackle those that you have skipped. Upon level completion, you’ll be rewarded with either a bronze, silver or gold award, opening the opportunity to revisit and improve upon previous scores. Challenges (essentially Achievements) grant additional longevity, for those that wish to invest the time, whilst leaderboards will allow you to compare yourself against global rankings and your friends. 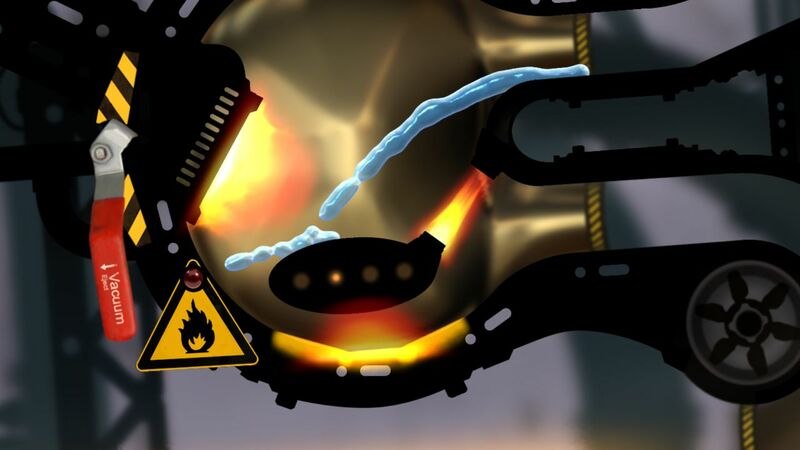 Graphically the game is well presented with charming animation and, naturally, an emphasis has been placed on the fluids themselves which prove particularly realistic as they splash around the screen. What truly shines in Puddle is the quality of its physics. Neko Entertainment having made commendable efforts that, despite grievances with level design, provide an entrancing experience in places. It just proves a shame that other facets detract from an otherwise promising start to their Nintendo eShop presence.